I just whipped through a pair of vintage George Sanders mysteries, and to my great sorrow, there are no more. 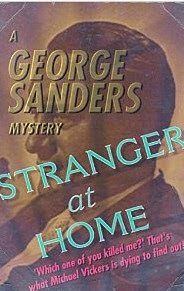 Crime on My Hands (1944) and Stranger at Home (1946) are two very different stories published under the actor's name, though primarily ghostwritten. The first is a comic whodunit, the other a bleaker noir tale. Each in their own way have the Sanders imprint though, and are enormously entertaining. Both are now available on eBook from Dean Street Press. 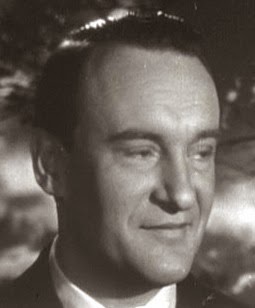 Nearly twenty years before he wrote his autobiography, Memoirs of a Professional Cad (1960) (which I reviewed here), and before his defining screen role as Addison Dewitt in All About Eve (1950), George Sanders had built a reputation as a screen detective in The Saint and Falcon series. His success in these ventures was further exploited when he was paired with ghostwriters Craig Rice (aka Georgiana Ann Randolph Rice) and Leigh Brackett, to lend his name and image to Crime on My Hands and Stranger at Home respectively. There have been rumblings that Sanders also contributed to at least Crime on My Hands and perhaps Stranger at Home. Much like his memoirs, there is plenty of the Sanders persona in Crime, in which he appears as himself. It is easy to believe that he gave much of himself to the project, though whether he actually put pen to paper is debatable. It is less clear whether Sanders had any involvement in Stranger at Home, which features a character that is easy to envision the actor playing, but not quite as much of his more lightly suave public image. The books are so different in tone, and adhere so closely to the particular style of each author, that it is almost certain that they are primarily written by Rice and Brackett. They are equally entertaining and both impressive examples of the skills these genre writers possessed. 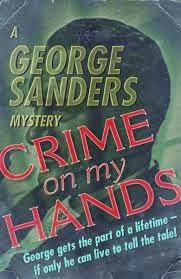 Crime on My Hands is a comic mystery in which Sanders plays himself, a successful screen detective who is looking to break typecasting with a lead role in a cowboy picture. When an extra is shot in the head mid-scene, the actor, and amateur inventor, is forced to play detective for real in order to clear his name. Sanders is surrounded by a huge cast of characters: extras, writers, producer, agents, director and stars. In the midst of this busy group, the primary characters rotate through the plot like players in an energetic farce. Though his life is often at stake, Sanders is perpetually amused, the peril is never greater than the laughs. The pace starts to slack a bit in the middle, where comic bits begin to stall the plot, but everything eventually gets back on track again for an enjoyably suspenseful finale. 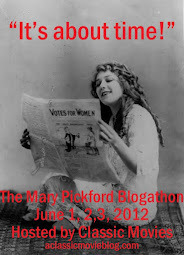 Rice was known as "the Dorothy Parker of detective fiction," and so she was well matched with Sanders. Her backstage murder mystery is full of comic mishaps, sharply-worded one-liners and surprising descriptions, such as the hardboiled, but amusing line, "he went out the door and disappeared into the night like a drop of water disappearing down a drain." It's tough to write a comedy novel that's funny without being too aggressively jokey, but Rice gets the balance right. She especially gets Sanders' voice; you can almost hear him speaking. While the sharpest of the witticisms seem to come from Rice, there are plenty of passages that read much like the dryly humorous style Sanders would adopt in his memoirs. There's also a great deal of the real actor in the character, including his interest in inventing and his skill in the kitchen, which he demonstrates by calmly preparing a mouthwatering steak and kidney pie in a moment of danger. The much darker Stranger at Home plays as a bleak, straight-ahead noir. It was perhaps too racy and brutal to be filmed back in the day, but the tone and the characters are much like the crime films of that period. It features Sanders-type anti-hero Michael Vickers, a Hollywood luxury store owner who returns home after going missing for four years. Though successful in business, Vickers is not a loveable sort, instead drawing friends who are in awe of his power and aloof confidence. He is welcomed warily by his estranged wife, her resentful assistant and companion, and the men with whom he was on vacation when he vanished. Vickers suspects that one of these three men is responsible for his disappearance and attempted murder. He is partially distracted from his quest when one of them is murdered at a drunken party the night of his return and he falls under suspicion. He must then solve the murder, and the mystery of his lost years, while attempting to reconcile with his wife. 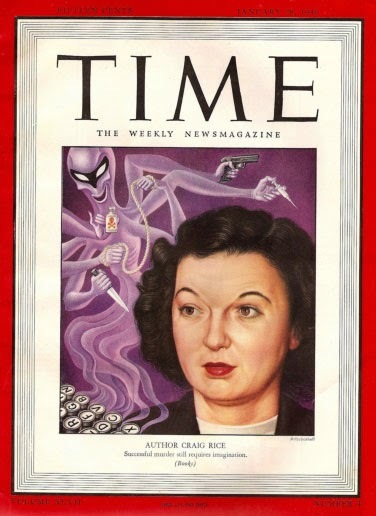 While Brackett was best known as a science fiction writer, she tackled many genres, in addition to working on the screenplays for The Big Sleep (1945) and The Long Goodbye (1973). She knew how to construct a grimy Raymond Chandler-style world. Though filled with familiar shady characters and steamy Southern California settings, Brackett creates an original story. For every twist you anticipate, there's another one that comes as a surprise. The briskly-told tale is made all the more entertaining by the way Brackett has perfectly wed Sanders' screen persona with Vickers'. Just as with Crime on My Hands, you can almost hear his voice. Both books are highly recommended for fans of George Sanders and vintage detective fiction. Many thanks to Dean Street Press for providing copies of the books for review. Unlikely Sanders had anything to do with these, a common Hollywood practice. Craig Rice also wrote Gypsy Rose Lee's G String Murders. One could see Lee providing background on that, possibly.